Perishable, poisonous if mishandled and reputedly fit only for the plates of the poor, the cassava plant is set for an east African makeover by agronomists who hope to unlock its potential as a cash crop with a host of industrial uses. The key, they say, is to add value locally. A programme led by the Alliance for a Green Revolution in Africa (AGRA), Farm Concern International (FCI), and various partners aims to improve the food security of small-scale farmers in Kenya, Uganda and Tanzania. The hope is also to capitalise on cassava’s utility as a source of products such as animal feed, glue, bio-fuel, and glucose syrup. New varieties with higher yields, less cyanide and better resistance to drought and disease are part of the project. “We are planning to set up 120 village processing units [which chip, dry and grate] within the next three years and to reach about 30,000 farmers who will learn how to increase commercial cassava production and to process it,” Kennedy Okech, programme manager of FCI, told IRIN. Farmers will be encouraged to switch from growing maize to cassava, with up to half the tuber crop going to industrial use. While cassava copes with drought and poor soil better than other crops, in east Africa “it has been marginalised because of its perishability if improperly treated. It also requires extensive processing to eliminate poisonous potassium cyanide,” Stefano Sebastaini Kuoko, of Tanzania’s Horticulture Research Institute (HRI), told IRIN. 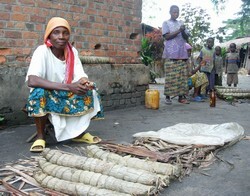 Cassava cannot be stored safely without drying and processing. The project will benefit from the work of Joseph Kamau, who has developed more than a dozen improved varieties of cassava at the Kenya Agricultural Research Institute. His team is developing varieties that mature quicker and contain more proteins. Kamau explained that the concentration of cyanide in cassava increases as temperatures fall and decreases as the tuber dries. As a result, cassava is particularly poisonous during rainy seasons. “We are working on crops with less cyanide to support the safety of consumers. Through our improved seeds, farmers have seen the advantages of generating income from selling cassava produce,” Kamau told IRIN. At the Nairobi launch of the project, Karen Nasubo, a Ugandan farmer, told IRIN she was already a convert. While the village-owned processing units are designed to deliver advantageous economies of scale to buyers, savings schemes partnered with commercial banks will also be established to offer the credit required to purchase inputs.